The much anticipated quarterly GDP numbers are out, and StatsCan confirmed what 79% of Canadians already felt to be the case — Canada’s economy is in decline. A drop in economic activity of 0.1% in the second quarter of 2015 officially tipped Canada in recession territory (after a drop of 0.2% in the first quarter). 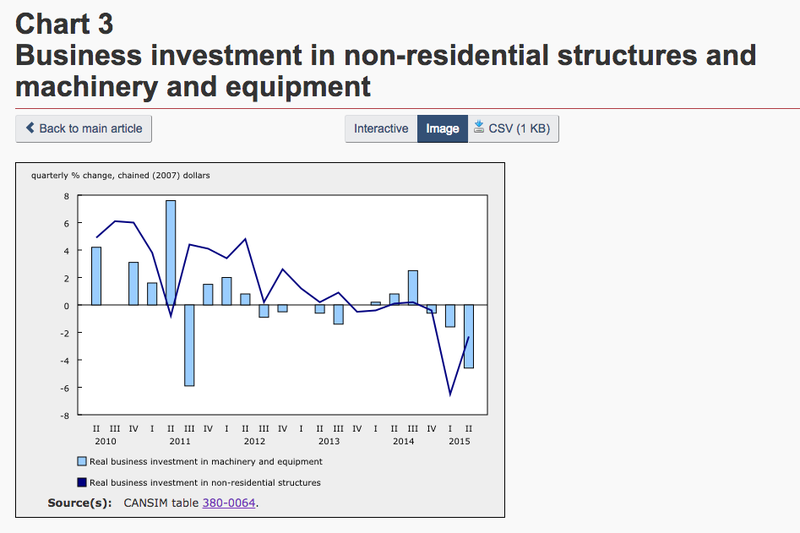 This decline comes on the heels of a long post-recession period of weak business investment since early 2012. You may remember the former governor of the Bank of Canada, Mark Carney, famously accusing companies of sitting on piles of “dead money” in the summer of 2012. A quick look at the statistics shows little has changed since. The problem is that without business investment, we can expect weaker job growth and a slower economy to continue. The Bank of Canada cut its interest rate in January 2015 in an attempt to to encourage investment and boost the economy. Unfortunately, all this seems to have done is further distort real estate markets, particularly in places like Vancouver where housing affordability is reaching record lows. Over the last decade, Canada’s economy has become overly reliant on mining and oil exports. It’s not surprising that when the price of oil and minerals drops sharply, as it has over the last year, our resource sector would be hit hard. But the economic decline extends beyond mining, oil and gas. Nine out of 20 major industries have been in decline or stagnating for the first six months of 2015. 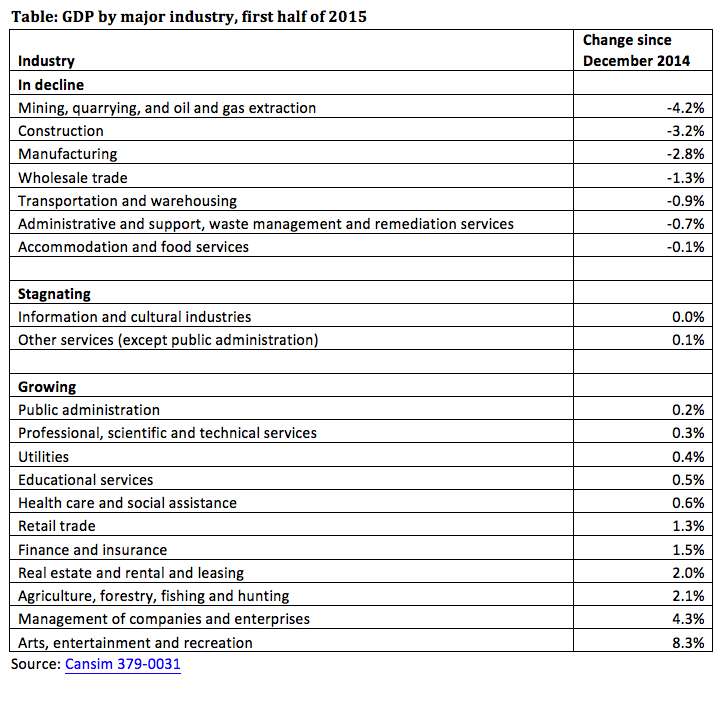 These nine industries account for close to half of Canada’s economic activity (46% of GDP in December 2014). You won’t see all industries scaling back unless the recession gets really bad, but it’s clear that the economic weakness is not confined to the resource sector. Some economic commentators have pointed to higher consumer spending as a beacon of light amidst negative economic news. However, this consumer spending is financed by increasing debt rather than by income growth — an often overlooked fact in the current debates. Statistics Canada reports that disposable household income declined in the second quarter of 2015. Debt remains a serious concern for Canadian families. 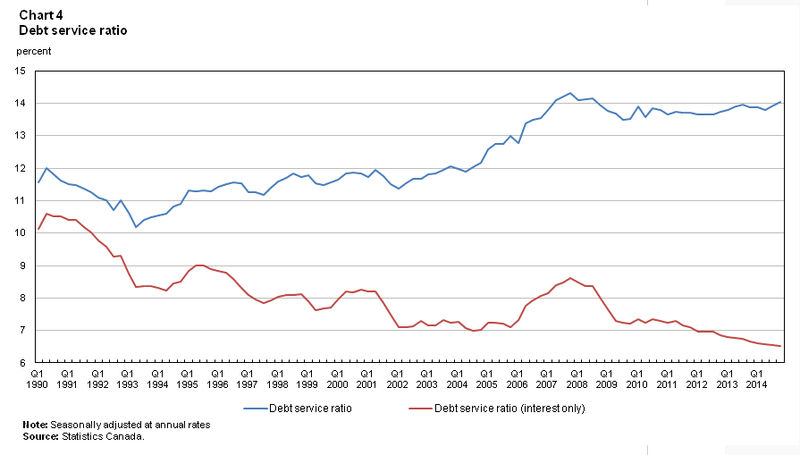 Despite record-low interest rates, total debt payments are taking up a rather large share of disposable income. Canadian households’ average debt-service ratio — the share of household income spent on debt payments, or the affordability of debt — has barely budged since the 2008/09 recession as new StatsCan data shows. Debt-financed consumer spending is hardly a sustainable economic driver, and if that’s all that’s nudging Canada’s economy forward, we’re in trouble. So while a quarterly drop in economic activity of 0.1% seems small, these three trends suggest that Canada’s domestic economic fundamentals are weak. Unless we’re prepared to remain at the mercy of global commodity markets, we need to be talking about what governments can do to diversify the economy and set Canada up on a path for good jobs and income growth. The CCPA Alternative Federal Budget is a great starting point. Iglika Ivanova is a senior economist at the Canadian Centre for Policy Alternatives’ BC Office. Follow Iglika on Twitter @IglikaIvanova.